For those of us who love music… we likely all have music heroes. There are those musicians who perform and write music that hits our psyche, those who make a certain time in our lives more than special. There are those musicians who have been present in our lives for a long-span of it, and continue to be part of the soundtrack of our lives over the rest of it. Music is a thread for me that has been present in one way or another for as long as I can remember. I had music at my fingertips since I was old enough to play those yellow plastic 78 rpm records and 45 rpm records with the big hole in the middle on a little record player I had in my bedroom. I remember when my brother gave me his old “transistor radio” that actually allowed me to travel with music everywhere I went. It was the beginning of a discovery of the variety of music in the world. Easy listening, classical, country – you name it. In particular rock and roll was in its infancy stages when I was quite young. I was enamored with the same hits that all older teens were listening to, and wanted to play it every waking hour. I learned about The Beatles there. In 1963 I had in my hand a $3.99 LP that my dad helped me buy from the local department store called “Introducing the Beatles”. A brown almost old fashioned themed cover on an odd label (V Jay) with 4 guys pictured on it that if they had shorter hair could have been the 4 Freshman, but they weren’t- they were significantly different. From that moment on I was willing to consume all of the British invasion – take in every nuance of reference to the Merseybeat, to the mods and sods of English ruffians. But no matter what – the Beatles were my central soundtrack. Through the 60’s as I was growing up, they were growing up too. They were moving the culture of a generation of music, others were following. Even in the initial times of the late 60’s rock renaissance explosion, the Beatles were the royalty of the rock music that had become so diverse in such a short time. So I here I am. Fifty years later. Still the fan of a group that has long since passed as music is depicted today. No wrecking ball, no electronic drums, no voice boxes. 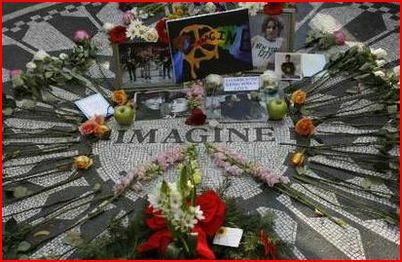 What I miss terribly are all the years that we lost when John Lennon was assassinated so early in his life. Like many before him and many since, there was a lot of music to consume in such a short time. But imagine what it would be if he had survived to be the senior musician his famous writing partner has become. What would we have experienced? That day in December 1980 will be indelibly in my mind. I was actually broadcasting on a local small town college radio station at the time. I spent the entire night with listeners who called in with disbelief as we listened to his music and remembered the day that made the music live for us. The music died that day. I still will remember it, hope many others do too. Daar word nie meer vandag sulke musiek gemaak nie. Regtig waar. Dankie vir jou besoek en kommentaar aan my pos. Baie van die wonderlike musiek vandag, maar Lennon se musiek sal altyd uit die verlede.